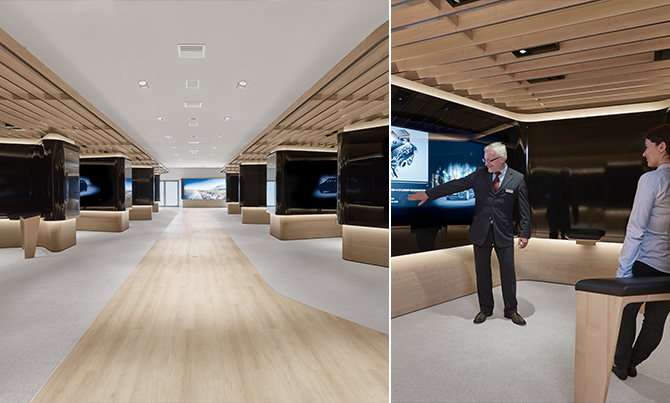 At the end of March, the Product Info Center (PIC) at BMW Welt was reopened with a completely new design by ART+COM Studios. The PIC invites customers, who collect a new automobile at BMW Welt, to a personal introduction to their new car by BMW specialists. The new dynamic architecture with its meandering wall structure, developed by the Berlin-based design and architecture studio COORDINATION, divides the space into individual briefing areas and moves between openness and discretion. On 290 square metres, up to 13 briefings can now take place simultaneously without interfering with each other. The briefing is personalized to the last detail and precisely tailored to the customer’s vehicle. To give the collector a detailed overview of individual highlights, functions, and features, the BMW specialists have access to a database-supported, interactive presentation system, developed by ART+COM. Whether “Motor”, “Lane Assistance” or “Head-up Display” – with the help of current 4k technology, touch sensors, and gesture recognition, complex vehicle functions are virtually explained – much easier than it would be possible at the actual car. The large-scale media applications are embedded in a circumferential medial horizon that connects all stations to a holistic spatial experience. A custom-built adaptive sound system supports the overall atmosphere in the PIC and provides the perfect soundtrack for every presentation. Each of the 13 briefing areas has a 6-channel audio system. The overall room sound and all briefing stations are synchronized and coordinated, although the soundtrack is generated for each briefing individually according to the duration of presentation. The sound design comes from Idee und Klang Audio Design, Basel und Klangerfinder, Stuttgart. At this year’s Automotive Brand Contest, the BMW Welt Product Info Center was awarded in the category “Architecture”.